For those not staying In miami where pickup is available- do note that parking near where the bus leaves from.can be expensive - we paid $50. The ride there was okay. But key west was beautiful and relaxing. The water was clear and warm. I loved it! It's a long trip 4 hours. We had to endure the air conditioner on the bus being too cold with no way to redirect the frigid stream elsewhere. There was a small bit of commentary, in both Spanish and English. The guide sells a town tour during the journey down. I'm glad the manager agreed to allow me to bring my foldable bike after some discussion. But I wish I had taken the Conch train for the commentary. On the way back its lights out with no commentary. 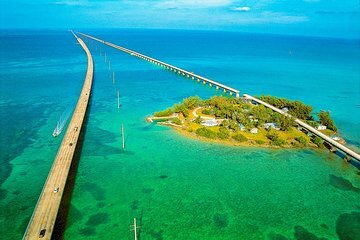 Florida Keys is beautiful! Loved all the small shops and Awesome places to eat and drink! Best part about it is you can relax and enjoy the views on the way home ! Defiantly doing this tour again next time in Miami!